The Hannibal YMCA is home to many locals looking to get in shape and increase their overall wellness. But some of these members are there for more than just losing weight and toning up. These members are pushing themselves to the limit everyday to fight back against the disabilities trying to keep them down. To them, going to workout with a personal trainer is about achieving goals they once thought to be impossible. However, it is hard for them all to get the most out of each session because of the limited equipment they can utilize. The Hannibal YMCA has a complete training center but very little accessible equipment. The 10+ members with limited motion or who are wheelchair bound can only use the free weights and cables that are open underneath and accessible to them. Anyone who has gone to a modern day gym knows that very minimal machines allow for free and full range of motion. 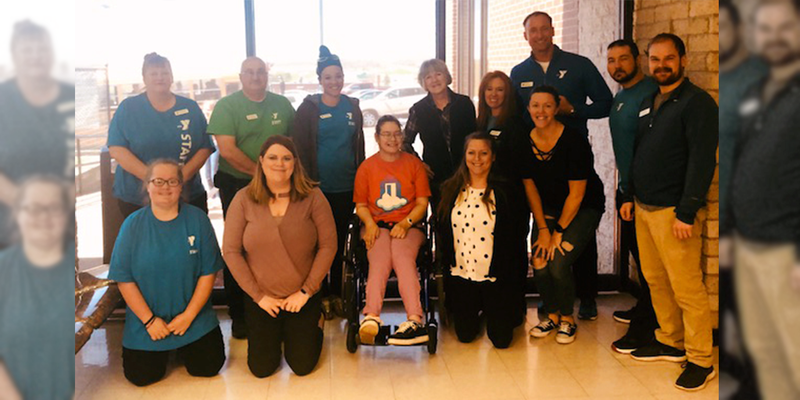 That is why the Hannibal YMCA Team and one of their most dedicated members, Audrey Pickett, have teamed up with the Dreamscape Foundation; to raise money for the accessible equipment they need to support all of their members and their community as a whole! One of the Y’s main programs in their facility is personal and group training sessions. The sessions and classes are instructed by their elite team of Certified Personal Trainers. But what they are in need of most, is new accessible gym equipment. Accessible gym equipment is all your typical machines but with a slight variation and guideline standards. The accessible gym equipment is specially designed to be usable to people with disabilities. For example, most machines are surrounded by other machines or walls, creating limited space to approach it. This makes it extremely difficult for someone in a wheelchair to access (if they can at all). Similarly, certain machines have set seats or back supports that can also inhibit access to those unable to stabilize themselves in the proper position. The only issue in acquiring new equipment is costs. Gym equipment is costly enough as is, but when you add the addition of accessible accommodations, these costs skyrocket. Currently, the Y has no equipment that is accessible by design. Only equipment that is naturally accessible, such as cable pullies, triceps and lat pulldown machines, and smith machines. They have done extensive research into all different kinds of accessible equipment and decided on two pieces that would benefit their facility as a whole. First is a Signature Series cable column, a Life Fitness product that has a two handle pully system that is open underneath and adjusts for all different movements. Second is a wheelchair accessible Scifit Bike, complete with two handheld rotating handles on the sides. This bike was designed with accessible features including a removable seat, true step through design, swivel seat that rotates 360° and much more. In order to raise the funds needed to help all members get the most out of their training, Dreamscape Foundation has teamed up with the folks at the Hannibal YMCA to conduct a series of fundraisers. I had the opportunity to speak with Audrey Pickett, a local and dedicated member of the Hannibal YMCA, who has lived her entire life in a wheelchair. She started attending training sessions last October, going three times a week. She had a goal in mind to strengthen her body to help her in all aspects of her every day life. For example, in the six months shes been training she reported, “it’s gotten me a lot stronger. I’ve noticed when I get to stand, I can stand for a longer period of time and I am not as tired!” To emphasize her progress even more, she now attends sessions six times a week! Twice as much as she was able to when she first started. Another major accomplishment she achieved in one of her classes, “I have gone from 5lb weights to 11lb weights in each hand.” To more than double your starting weight in a matter of months is a huge accomplishment for any new weight lifter! To Audrey, the YMCA has become an extended family of hers. In addition to training there she has grown so close to the staff and members, she even volunteers at the front desk to help give back. 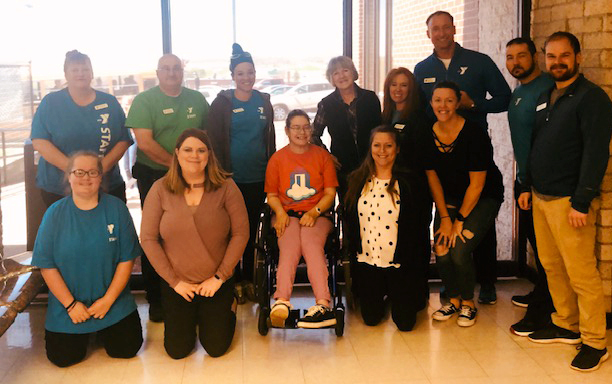 The rest of the Hannibal YMCA team describes her as, “a ray of sunshine”, always happy and spreading joy to everyone she comes into contact with. Despite her disability, Audrey is always positive, motivated and definitely has a sense of humor. In the brief conversation we had, much of that time was spent laughing and cracking jokes. She did have a few words of motivation to share with anyone who is trying to get started but might be scared or worried. “Just take a leap of faith. Don’t be afraid with it, its easier said then done, but once you start you won’t regret it and if you have that dedication or drive don’t just let it sit. A lot of people have told me no in my daily life, here no is not an option. If I find a no, I find a way to make it a yes”, Audrey said. On a final note, Audrey is driven and dedicated to better not only herself but everyone struggling with their own lives and disabilities. She knows that people are defined by their abilities and what they can achieve not what they can’t and that’s what we need to focus on! If you would like to help out, we urge everyone to contribute what they can to our Hannibal YMCA campaigns, dedicated to funding accessible equipment for their facilities and to help Audrey continue her training programs.